Our fully equipped air-conditioned gym offers over 130 pieces of stylish new Technogym fitness equipment along with a range of fitness equipment. This includes cardiovascular machines from treadmills to step machines and resistance equipment, including free weights and dedicated functional fitness and stretching area. There are 2 pools in the centre. Swimming is a great way to exercise with little strain of joints and muscles whilst still improving your fitness. It is even FREE for Waltham Forest residents Under 18, Over 60, Armed Forces and People with Disabilities. The centre boasts 2 x large fitness studios, programmed with a range of Fitness Classes to vary your workout - from beginners to advanced level - in a fun and sociable environment. Extreme Play – Play shouldn’t be easy, it should be about having fun while challenging yourself, our extreme play zone has 4 floors of obstacles and slides to enjoy. Extreme Trampoline – you can dodge, dunk and dive into a heap of fun. Our unique bounce arena has a mix of fun features, so there's something for everyone to enjoy. So what are you waiting for, pop in to see us and get bouncing. Extreme Ninja Run – Come and challenge yourself on our extreme ninja run and see if you can complete the course. 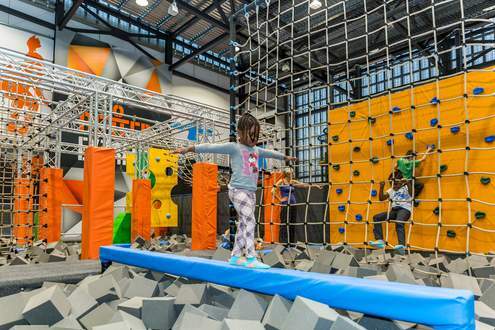 This extreme obstacle course consists of 12 features that will test your agility, strength and endurance. 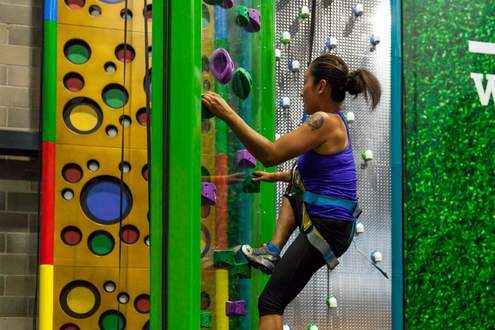 Our state-of-the-art climbing wall system provides an exciting, fun adventure in a safe, supervised environment, whatever your age and experience. Equipment is available to hire at reception for a small charge. For casual bookings members can book 6 days in advance, whilst non-members can book 5 days in advance. Our Multi Use Games Area (MUGA) is ideal for 5-a-side football. The MUGA pitch is fully enclosed and floodlit, making it available for bookings during centre opening hours. There are floor markings indicating goal areas and half way line. Various other sports and activities can also be played in the MUGA. The Track at Waltham Forest Feel Good Centre was resurfaced in 2013. Using the Athletics Track is a great way of improving your fitness and speed without using the gym. Our 400m grade A running track is used by the public, clubs and for competitions. Better Athletics offers the opportunity to develop your athletics skills in a safe environment led by UK Athletics qualified coaches. Athletics is a sport for all so come along and develop your skills - whether in Track and Field, park runs and jogging. The soft play area gives children freedom to play and use their imagination in a specially built maze of ball ponds, slides, climbing frames and sensory equipment. The area is set over three levels over a 6 metre high set. Children must be supervised at all times whilst in the soft play area. Adults and children must wear socks while on the facilities. Spa Experience offers the perfect escape from stresses and strains of city life. 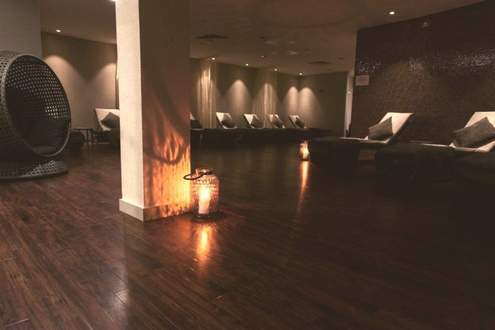 Spa Exprience has 4 premium treatment rooms with a full range of relaxation and beauty therapies from our leading international brands including; Elemis, Essie and Fake Bake. Each carefully selected for their use of natural marine and mineral ingredients. Why not sit down and relax with a coffee and a croissant in our Better Coffee Corner. With a relaxing atmosphere, free wifi, and a viewing area overlooking the athletics track it is the perfect place to get refreshed or simply grab lunch. Crèche for under 5's gives you the chance to take part in activities around the centre, knowing your children are well-cared for. You can leave your child for up to two hours. The initial opening hours for our crèche will be Monday-Friday, 09:30-13:30. Our Crèche is OFSTED Registered. This means that the Crèche is regulated and inspected to ensure the care of the children who attend is of an excellent standard. **First visits are 1 hour in duration to settle in and registration form completion will be necessary. The Multi Activity Room provides a great location to continue the birthday celebrations with some party food and drink, and not forgetting the cutting of the cake. Tables and chairs are provided as part of the hire and we will even take care of the cleaning up afterwards so you can sit back, relax and enjoy your child’s special day with them. When it comes to your child’s birthday party, Waltham Forest Feel Good Centre has everything all wrapped up. With friendly, expert supervision and loads of fun activities, your child’s sure to have a party that gets the whole playground talking. 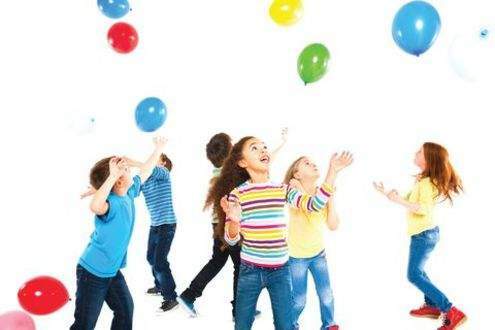 From Soft Play Parties to Sports Parties there really is something exciting for everybody. And if you’re looking for a birthday that makes a real splash, our swimming parties are brilliant for all ages. We’ll even take care of the cleaning up afterwards. Mums and dads, uncles and aunties, nan's and grandad's are welcome too. Whether you want to get involved in the games or enjoy the proceedings from the touchline whatever your choice you can sit back, relax and watch them enjoy their special day.